Intel briefly listed two 10nm Cannon Lake processors in a microcode update document this week, confirming that it has shipped such chips, although we expect it to be in small quantities. Intel has since removed the references to them from the public version of the paper. Intel has adjusted its 10nm roadmap multiple times in the recent years. Back in 2013, the company planned to make CPUs produced using its 10nm technology available in 2015. Then, the company pushed them to 2016, but that was a minor change. In mid-2015 the chipmaker delayed its 10 nm products to late 2017. Then in early-2016, Intel switched its “Tick-Tock” cadence to “Process-Architecture-Optimization” model, officially prolonging lifecycles of its manufacturing technology nodes and changing its approach to new product development in general. When it comes to 10 nm products, Intel has not made formal announcements about any product family yet, but said earlier this year in a side-presentation to its CES keynote that it had shipped some of them to customers in 2017. Since the company did not disclose any details about the 10nm CPUs it shipped, it naturally caused further questions on the state of Intel's 10nm process in general and when the Cannon Lake products, expected to be the first on 10nm, were coming. Fortunately, our friends at Tom’s Hardware noticed Cannon Lake processors in the latest version of Intel’s microcode update document earlier this week. After the fact, Intel has since removed the references from the document. The first version of the document, as it appears, suggests that Intel has shipped Cannon Lake-U CPUs in 2+2 and 2+0 configurations to undisclosed customers. The “2+2” denotes that a chip has two processing cores (the first number) as well as GT2-class graphics (the second number), whereas the “2+0” indicates that a dual-core chip has no iGPU at all. Intel’s “U” series parts, aimed at the 15W notebook market, usually feature an integrated chipset in the CPU package. Therefore, the CNL-U 2+2 and CNL-U 2+0 parts are aimed primarily at mobile and low-power applications. It is noteworthy that in the recent years Intel has begun commercial roll-outs of its new CPUs starting with ultra-low-power 4.5W Y-series processors, e.g., Broadwell-Y in 2014, Skylake-Y in 2015, and Kaby Lake-Y in 2016. If Intel is launching its U-series chips with a TDP of 15 W first for 10nm, this would indicate a change in policy. So it is surprising to see that Intel has started shipments of Cannon Lake-U, but not Cannon Lake-Y. A natural question that arises because of the listing is whether Intel has started to ship its CNL-U parts in mass quantities to PC makers. Intel has not disclosed where these parts have been sold, which could be for entry-level low-power laptops, or to certain specific customers and requests with custom/semi-custom CNL products. 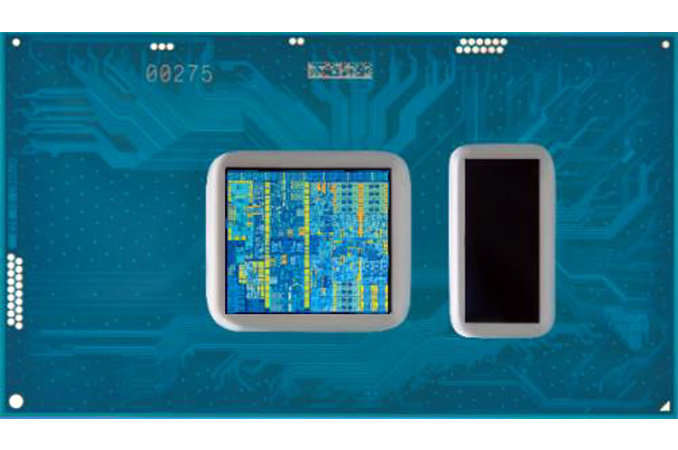 While a CNL-U 2+2 CPU could be used for inexpensive notebooks, a CNL 2+0 part would fit into applications that either do not require a display controller at all (such as routers, NAS, DAS, etc. ), or can use a discrete GPU (a low-end PC with a low-end/outdated dGPU - there are a lot of such machines sold in developing countries, a system for software/hardware development/compatibility tests/etc.). Unfortunately, at this point it is completely unclear where Intel has shipped these 10nm parts. "The “2+2” denotes that a chip has two processing cores (the first number) as well as GT2-class graphics (the second number)"
It is possible that with 10nm that U products have low enough power to perform so that Y series is no longer need and entire U series will be fanless. The source link pointed out something about low power NVidia MX130 GPU - it would be awesome if Intel/Nvidia could do a similar package as Intel/AMD package. There is no reason that NVidia could also take advantage of Intel's new embedded bus. It is in no way "still relevant". TDP was, is and will always be the most important metric related to heat management of any system, from mobile to servers. The Cannon Lake dies will obviously be much smaller (unless they used the extra space to double the L2 & L3 caches, for instance, but that's very doubtful) and thus will dissipate more heat per mm^2, even if they are more power efficient. What I found really exciting is what Intel / Dell has done with Dell XPS 15 2in1 - the 870xG CPU chip is quite powerful chip - and it suppose to be 100W for CPU and GPU combination and GPU should use more power that CPU - especially with 8550U only takes 15W - but this CPU is probable around 35W-45W for faster performance. But what makes this notebook so amazing is cooling system on it and it allows 15 hour battery life even with GPU.in it. But my purchase decision is what about other XPS 15 lines - maybe a 6 Correct 8550 mobile Coffer lake version with NVidia GPU. Well some one will be fool, if you think Intel is not coming back extremely hard after the last year of competition both from AMD and likely more importantly because Qualcomm and Microsoft. Well currently roadmaps looks like Intel will have a quite powerful 6 core 12 thread notebook this year and who knows maybe in extreme version 8 or more cores coming. As for Cannon Lake, it could be test bed - and Intel may have made advancements in 10nm++ and because of AMD's Zen and incensement of core count, Intel would like beef up production in main line.